For the first time in my career, I will be working on a project which requires the use of metric (hard metric at that!) units. I am curious about the experience of those who normally work with imperial units like I do. My hunch is I should not try to convert units back and forth, but instead dive right in and do calculations and drawings in metric. Train myself to think in metric, so to speak. I'd disagree, unless you're going to spend a lot more time working in metric your ability to look at calculations and quickly find errors, or you ability to apply rules of thumb, will be difficult in metric. I'd simply do everything in imperial units and convert to metric as appropriate for your output. Using mathcad or other software that can switch units seamlessly will likely be highly valuable. Whatever you do, don't mix and match systems (NASA...). Stick to one system and be consistent in when you switch over units in the design. Of course, if you're collaborating or otherwise need to have your calculations reviewed by people experienced in science units, then I'd do as you say and start out entirely in metric. In the end, it's simply a unit conversion and nothing should really change other than your personal efficiency. I have done a couple retaining wall projects like this. We had existing Excel spreadsheets that were all set up in Imperial units so they could not be converted easily. Our solution was that we designed the entire project in imperial units, and then converted to SI at the end. We then had to painstakingly check the plans and adjust for rounding and conversion issues. Since these were large retaining walls, it did not matter too much if the footings or wall height was a centimeter too tall or short. If you can easily convert to SI units on the front end then I would recommend going that way. If not, then I think you have to go the route we did. It was a little painful, but we got through it. if you're not using a metric design code, then you'll be in for a bunch of back and forth; no? if you are, then does it matter ? dimensions, loads, allowables all metric (or imperial) ... the problem with existing s/sheets is most likely conversion factors (inches to feet, "g"). The biggest problem is having a sense of what these funny units mean (ie you know what imperial sizes mean). Edit: I made an unfair comparison; metric would be something like 20mm / 5mm = 4 plys, but hopefully the point got across that decimal units are sometimes not as easy as fractions for doing math in your head. which would allow you to use any compatible unit and the program will normalize to the correct units for the empirical formula. btw, Smath Studio is completely free. For the project in general, does the dimensions of the finished product have to be somewhat "even" numbers. For example, kitchen cabinets in imperial are 2' wide but metric cabinets are 600 mm. 2' is not equal to 600 mm. Do you want a floor level 10' above the ground or 3,000 mm? If you do need a 600 mm wide (not 609.6 mm) then I suggest determining the design dimensions based on mm, convert that to feet/inches and then use imperial for your calculations. I agree heavily with some previous posts, we do not identify metric numbers in our heads very easy. When you make a math mistake, it may appear correct. I can easily convert parts per million from imperial to metric and vice versus. You multiply imperial ppm x 1 and raise it the 1st power, then add 0. Other than that, I am lost. I'm a bit backwards. I much prefer to run loads in imperial and even doing the analysis in imperial. I've memorized all the important conversions and convert the final analysis numbers to metric to do the design. On a side note, we had a DOT require metric for all drawings, etc. Then they wanted a imperial set so they could check it easy enough and also something for the contractor to build from. We endeded up doing dual units on the drawings. Funny huh? As a person who consistently works in both systems, I wouldn't document in the one you're not comfortable with unless all those documents really need to be in metric or you're going to be doing this a huge amount in the future. It would take a lot to get me to document my math in imperial, even though I use it every day and I can convert most major engineering units in my head. Do your math in the units you're comfortable with. Convert the input and output, as necessary. Then do the drawings in metric. You're not going to do a good job seeing mistakes in intermediate steps in a unit system you're not used to working with. It's easy enough to pick imperial forces and dimensions close enough to round metric numbers that design is still fine. I am in the case of robyengIT and I agree with him. Solve everything in your units system and convert just results. If you're not in the habit of converting units, I would suggest at least using SMath to do the conversions and/or checking conversions. I've seen examples of unit conversions embedded in Excel worksheets and they can be a nightmare to trace through and verify. In SMath, it's pretty simple; type in your quantity, with the original unit, and type an "="
For basic engineering, it's also completely reasonable to use the limited version of mathcad. You can't do the more advanced styles of calculation and solving, but for basic math and unit conversion, Mathcad express can get the job done. Excel has a "Convert" function which is fairly simple. I do tons of switching back and forth between metric and imperial (the joys of working in Canada), and can't recommend doing all your calcs in Smath or Mathcad enough. You're probably getting your inputs in metric, which leaves you to convert into a messy number at the start of the calc and convert back to a messy number at the end of the calc to get back into metric. Mathcad/Smath will you let you see intermediate results in imperial so you get feel for the answer, but you can dump all the final results out in metric at the end. If you are only going to do one job in SI units, it is probably not worth your effort to learn to think SI. It took me 6 months or a year. But it is much simpler once you get used to it. Just one piece of advice...with length measurements, only use metres and millimetres. Discard the centimetre. That is for dressmakers. I'll second the ones who are saying to do your calculations in USC units and then convert to SI, unless you're going to work on lots more SI jobs. A lot of our judgment comes from having an innate -- effortless -- sense about whether a number is reasonable or not. The "Convert" function in Excel seems to have a seemingly arbitrary set of conversions. Certainly, furlongs/fortnite isn't available, but others, like cubic centimeters or even kilograms aren't available, while cubic picas and Admiralty knots are. It seems that for each unit type Excel Convert offers just one base SI unit, so m3 (orm^3), or g, but I agree, for practical use it is pretty hopeless. For those who want to do unit conversion in Excel, my EvalU spreadsheet will do unit aware calculations, with a wide range of units, and you can add more if you want to. If working to a metric code I would recommend working in metric units, then review the final design in imperial. Apart from anything else, there are many code specified values that have inconsistent units, such as tensile strength etc. minor nitnoid, the gram is not a base SI unit, it's the kilogram. The gram is a base unit of the CGS system. IRstuff - quite right. I knew there was something a bit strange about having g as the base unit. DaveAtkins- What is "hard" metric by the way? Since this is the structural forum, 271828's caution about developing an innate sense as to whether a number is reasonable or not means consideration of the main units we use. In the US, you use lb/ft^2 for loading, while in the SI world, we use kPa. For stress, you use psi or ksi, we use MPa. For bending moment, you use kip-ft (or ft-kip), we use kNm. For force, you use kips, we use kN. It takes a while to develop the innate feel he is talking about. I recently moved to a metric country. SMath is my best friend -- I have it open constantly. Easy to do calculations in either units, both side-by-side for gut checks, or even mixed units when I'm in a rush and don't want to look up a constant that I know in the other units (eg unit weight of concrete). Mathcad prime is fine also, but I got tired of them breaking compatibility with each release. Talking about calibrating our mindsets -- it's still weird to me that a kN is much less than a kip... But a kNm and kip-ft aren't that different. With soft metric, a 1/2" diameter bar is called a 13 mm bar, even though it is really 12.7 mm diameter. With hard metric, a 13 mm bar would actually be 13 mm in diameter. So conversions to imperial would not be exact. Another advantage of SMath and Mathcad is the ability to define convenience units, like microflicks, useful in hyperspectral work, and my favorites, furlong, or fortnight, although the more recent versions came with them already defined. I suppose that if you use a custom function, you can do likewise in Excel, but then you're talking VBA modules that you have to make portable. 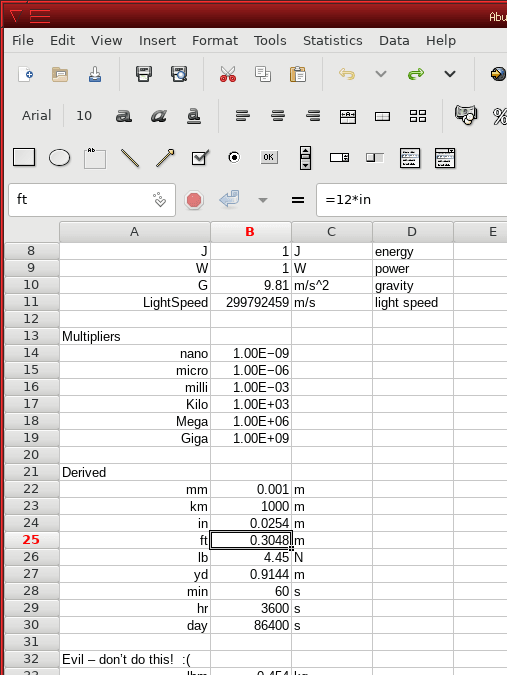 Now, you can type =23*ft+16.5*in, and convert the result to whatever units you want. The evil stuff got cut off. It is kgf and lbm. Evil. drawoh, Excel also has the CONVERT function, which has many of the common conversion factors already programmed. I have worked with metric units all my life and find the imperial units fairly confusing. But when I have done several projects in countries that require imperial units. The solution is simple, give two results, one in each unit system. In MathCad it is simple. "By hand", not that difficult. That was an approach we used with a project in the US several years ago, suggested by a PE. And it worked and works just fine. It is often just a matter of talking to the "other guy" and to agree on a reasonable approach. But I would not build a FEM-model based on imperial units, the software I use has no built-in units. That would not feel comfortable at all since I would loose many "sanity checks". What is a reasonable result? Based on where where your PE and SE are registered ( Illinois and Wisconsin ) I'm guessing the materials you will be using/specifying are Imperial/inch. As others said, calling 3/4 inch plywood, 1/2-13 fasteners, or 14 g steel by their "hard metric" equivalents is just looking for trouble. AutoCad, for one, supports automatic dual dimensioning making drawings, at least, fully functional. The real metric folks don't do that when they use "our" stuff. Wheel diameters. Inch, even when the bolt circle, etc and etc are real metric. Of course some like Volvo, have "inch" bolt circles, and maybe even inch center hub pilot bores, but probably inheriting them from the early days. I suppose that if you use a custom function, you can do likewise in Excel, but then you're talking VBA modules that you have to make portable. Save it as an add-in. There's lots of good advice in this thread. Document in your familiar units or use a calculation program. And know how to communicate in the unit system so that other disciplines are on the same page. I'm in Excel right now trying to find the metric conversion for radians. I can convert to grads and then find the metric (or imperial?) equivalent? This will be for a project in a less than one "g" environment so I have to consider force "g" vs. force "f"? I don't think either system can be called "metric". Buggar, radians measure a ratio; there are no units, metric or otherwise. A point of disagreement to most that have posted here: as someone who's had to learn both systems, I'd suggest trying out the calculations in metric, then converting the important results to a 'gut feel' number in imperial that you can get the sense of quickly. If all seems right, you're probably set. If something seems off, keep digging. In the end, it's just math. Keep your units straight and you'll be fine. Radians are also used with imperial calculations. Radians, degrees, pitch, slope, percent grade, etc. can all be used seamlessly in conjunction with either system, since they are unitless values. Definitely stick to just metric when documenting the drawings, its usual practice/good practice to coordinate/locate structure to the nearest 5mm to avoid odd measurements that imperial conversions can give you. Make sure if converting either way that you make up the missing millimeters. Over a long distance across a whole building you might end up missing 10-15mm of length. Certainly seen it happen before on some jobs I did early in my career in American Samoa, we provided both imperial and the nearest/rounded metric measurement to the nearest mm on the drawings. If you added up all the mm dimensions they didn't quite add up to the imperial measurement due to rounding errors inherent in this way of doing things. We designed it all in metric using UBC97 metric equations, but using equivalent imperial thicknesses and lengths converted (i.e. 12" wall was designed as 305mm thick). Then for the contractor basically had dual measurements in autocad as someone else noted. So as long as you use 300mm = 11.811023" no problems and stay away from thinking in 8th's/16th's of an inch no problems! Of course, the number one thing is to attach units labels to all the values. Don't like NASA. That was not a units problem, per se, but a management problem. Someone(s) failed to check the interface control documents (ICDs) and more someone(s) failed to test the interfaces. Additionally, upon investigation, it was discovered that NASA actually saw the problem several times in actual flight, manifested as position errors of the spacecraft on its way to Mars, but no one bothered to check why. Had ANYONE been paying attention over the course of a couple years, the disaster could have be averted. I expected you would have a more intimate knowledge of that screwup than I, IRstuff. My point was simply that the error began with a failure to label or clarify the units of the numbers conveyed. Although, I just realized I didn't do so well at conveying my thoughts, either - "Don't like NASA. ", what the heck was that? The units were likely labeled, since the ICDs are critical deliverables in any aerospace design. There's typically a massive table of data being transferred across an interface, and there would be a item name, numerical range, scaling factor (if needed), and unit. Both sides of the interface would have had reviews and agreed upon all the data types and formats, etc. Usually, the Interface Description Document (IDD) would be transferred a few times across the subcontractor interface for the two parties to agree on the exactly byte counts, etc. It's likely that both sides probably even agreed on the SI units. While it's never been reported, I suspect that like a couple of engineers in my company, their propulsion engineers ALWAYS design in US units and then convert to SI when documenting, and this one time they forgot to do the conversion in the deliverable code. Even still, something should have been detected during the software unit testing, so someone screwed that up, as well. I spent quite a few years in school with metric, and it was always the SI system. But surprise, the real world doesn't always use SI. So there was a post the other day referencing kgf. We get foreign mill certs on occasion that will show kgf/cm^2 as stress units. And the metric drawings I've seen just showed every dimension in millimeters without any indication of units. So instead of "31.823 meters", it would just show "31823" on the dimension arrow. The point is, check local usage to confirm what they want, if you haven't seen similar drawings from there. I think I've tried everything that's been suggested so far at least once. Combined units in Excel is the WORST and I will never NEVER do that again. Using either Mathcad or SMath, do your calculations in the default units system, putting all the "x=#" values in a column on the right. Leave a spare 2 inches of blank space on the right side of the page. Copy-Paste the right-hand column of values into a second column in the blank space. Correct the units in the new list so now your page tells the reader the value in BOTH SYSTEMS. You can leave one column in metric, the other column in Imperial. This allows the yankee curmudgeons and the high-strung europeans alike to read all of your calculations. I was just over watching the latest video from The Hydraulic Press channel on YouTube. The guy's got a load cell attached to his press, and in this case, he's measuring the force required to push nails into wood. And the unit of force is: Kg. I don't remember for sure, but I think his press hydraulic pressure is in bars, if so, there's another non-SI unit cropping up. If you want to be strickt you have to differ between SI base units and derived units. There are also units that are related to the SI system in a very simple manner, like bars. The unit for force, Newton, is not a SI base unit but derived from kg, m and s. I have more than once noticed that force and mass are treated as being the same. Especially some software's don't make a difference between the two properties. It seems several people have strong opinions one way or the other about MathCad, SMath, and Excel. Personally, I much prefer Excel. I'm fairly sure it's a matter of familiarity, for myself, at least (haven't tried Smath, and MathCad only a couple of times). I suspect it's the same for others. For those who aren't already 'locked in' to one of them, I suggest trying out whatever ones you have access to, so that you can decide for yourself what works for you. There's a ton of stuff that I can do easily in Excel that I don't know if the other programs will do, and I sure wouldn't know how make them do (like rotating a table of values, columns to rows). Obviously, they will all work for converting units. Excel does it fairly easily, either by reference, lookup, for by the preprogrammed function. It looks fairly easy in the other programs as well. since pascal is the default pressure unit, the conversion is automatic. is messed up because I used a velocity, so result is not a simple pressure. Nevertheless, there are obvious things that Excel excels at, like any table-formatted data and the graphing thereof; graphing data is something Mathcad is still struggling with. If I was picking a program to start out with, especially if I was doing alot of unit conversions, I would probably take a long look at one of those other programs. Having units inherent in the program would definitely be easier, and would catch some potential errors. Currently the Evalu function does not recognise units embedded in the function to be evaluated, so you have to define them as named parameters with a value of 1, and enter them as a factor, such as 5*dyn. You can name the units whatever you want, so for instance I have named nmi (nautical miles), which is a defined unit in the spreadsheet, as nmile. You can also redefine existing units, such as kt (knot), which I have defined as 1.852 km/h, which is the exact official definition, agreeing with the SMath result. Note that the current spreadsheet uses an approximation which is only accurate to about 5 SF. I will upload a corrected version later today. You can also define new units, such as the ksmoot, equal to 1000 smoots. Units4Excel can be downloaded from Units4Excel. There is also a Python version at Units and solvers with Pint and Sympy. Note that this is a work in progress, and requires installed versions of Python and xlwings. I get that if someone has nothing else, then Units4Excel is a great workaround, but I'm not convinced it's as easily usable as Mathcad; obviously, Mathcad requires considerable coin, so it's not for everyone, but SMath is free. For example, you can't put in ft2 in to K13 and get a valid answer in the example spreadsheet because you need to input "sq ft," which means that you need to remember that for whatever reason, the English units were defined with sq (unit), while the metric was defined with (unit)2, neither of which are natural notations. In Mathcad, ft^2 is simply the square of the basic "ft" unit, and that means that ft^n, where n is any number is automatically usable without additional work or thought from the user. IRstuff - I'm not saying my spreadsheet is better than SMath, or even as good as SMath, just for people who don't know SMath, or who have an application where they prefer to use a spreadsheet, it provides the units functionality to get the job done. Regarding derived imperial units, you are right that it won't do them, but you can add any unit you like on the Ext Unit List sheet, and it will then be available after saving and restarting. No worries; like I said, I use Excel quite a bit, in conjunction with Mathcad.